There’s a few key things about scalp biopsies of lichen planopilaris (LPP) that are really is helpful to evaluate when looking under the microscope. These include the cell death of hair follicle keratinocytes (so called “lichenoid change” in the earliest stages as well as loss of sebaceous glands (oil glands) over time. There are, of course, many other changes that can be seen and that a pathologist or dermatopathologist may offer comments. These include reductions in hair density, perifollicular fibrosis, and inflammation in the upper parts of the hair follicle. Changes in the skin layer (lichen planus-like changes) and dilated eccrine glands can also be a part of the pathology. Unfortunately, there tends to be an extreme focus at times on documentation of perifollicular fibrosis and perifollicular inflammation when evaluating LPP. Certainly these are important and present in LPP. The problem is that they are not diagnostic of LPP as these findings are common in androgenetic alopecia too. In fact, up to 3/4 of patients with AGA have some degree of perifollicular fibrosis and about 1/3 or more have significant perifollicular inflammation. The photo here shows typical features of the “lichenoid” change that accompanies LPP. 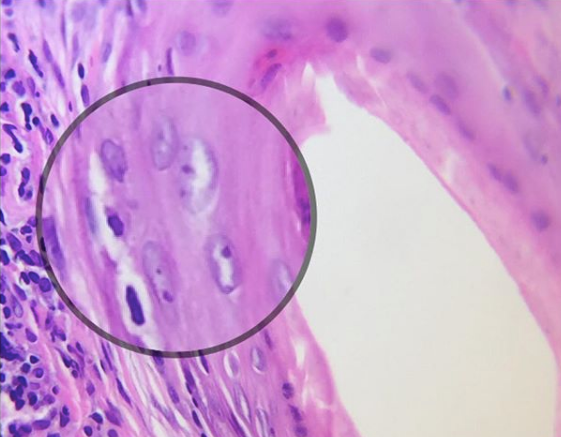 There is inflammation in the root sheath and some hair follicle keratinocytes are showing vacuolar change and cell death.